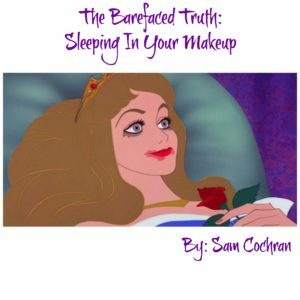 Recently, I had a patient tell me about this amazing makeup that “you can sleep in” and that “it has really great ingredients that are great for pimples and antiaging”. Huh? Nope! This is the problem. Uneducated professionals lying about product ingredients & using it as a marketing tool. Sure, it sounds super attractive to consumers to not have to wash their face or apply serums before bed. Sorry to be the bearer of bad news, but this is untrue. No matter what your makeup contains, you still should cleanse your skin before you go to sleep. I am not trying to be an unsympathetic rule follower, but skin is my specialty. I am aware of what makeup does to the skin and how critical it can be if left on over long periods of time habitually. I get it! I’m a working mom. I have 2 boys age 10 & 14 in baseball…I totally get it! I’ve had those nights where I barely made it in the door alive and the last thing I felt like doing was washing my face. So, have I had those nights – yes. Will it destroy my skin if I wiped out and completely forgot – no. The occasional “oops” is okay, but habitually sleeping in makeup or relying on your makeup to improve your skin health is dangerous. Sleep is just as important for your skin as it is for your mind & body. When we sleep, we have increased cellular turnover and our skin repairs itself from the damage done during the day from the sun, free radicals and pollution. Sleeping in your makeup can increase your exposure to free radicals. This leads to collagen breakdown & skin that ages faster. Having a clean face before bed can also ensure less breakouts & congestion. Although this seems the obvious reason, wearing makeup to sleep can trap oils under the skin causing breakouts. While we sleep, our cells are lubricating hair follicles. The oil moves from the follicle to the surface as part of a healthy skin cycle. If the surface is packed with makeup, the cells cannot function and the lubrication process starts to backup. This can lead to acne. Besides face makeup, mascara & liner can be just as dangerous if left on overnight. Eye irritation, redness, dryness, and even infection are possible concerns from mascara or liner left on overnight. When the hair follicles & glands on the eyelid become clogged, painful bumps, styles or hordeolums, can form. Also, mascara can severely dry out the lashes causing them to become brittle and break. I think I’ve given you plenty of reasons to cleanse your skin before bed. Besides a good cleanse, you want to repair & improve your skin health with good pharmaceutical products. I know, I know…no one wants a list of steps to do. We are already pushing through just to cleanse. I have a super easy solution that will improve your skin health & leave your skin looking and feeling amazing! What’s the secret? ZO Skin Health & Medical products! Dr. Obagi has formulated a system that is quick, easy, and super effective. He even has an option for those lazy nights where we literally CAN’T. I would love to help! Based on your individualized skin care needs, I can prescribe the perfect products to transform your skin! Call 985-893-6073 to schedule your FREE skin care consultation with me!